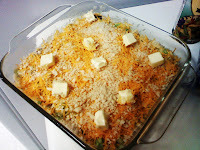 Sunny Anderson's Cheesy Mushroom and Broccoli Casserole...You must try this! This is absolutely the BEST broccoli cheese casserole that I have ever had! I just served it as a side with pan fried chicken and gravy. You could also mix some cooked cubed/shredded chicken into the casserole to make a complete meal. However, I love the creaminess without the chicken. I also topped the casserole with panko crumbs and cubes of butter along with the cheese. I love the crispiness that panko crumbs give to it. Try it...you will like it! Butter casserole dish. In a large pot, melt 3 tablespoons butter. Sprinkle with flour and whisk to make a roux. Let it cook a few minutes, whisking continuously. The roux should resemble the color of peanut butter. Add mushrooms, onion, garlic, garlic powder, cayenne pepper, heavy cream and chicken stock. Add broccoli, 1 cup of the cheese and rice. Season with salt and pepper, to taste. Pour into buttered dish and top with remaining shredded Cheddar. Bake until cheese is melted and golden, about 20 minutes. Note: In a separate small saute pan, I sauteed the mushrooms, onions, and garlic before adding them to the roux. So, I got this free magazine in the mail the other day and it had this recipe in it. The picture of the braided loaf is gorgeous! Chris said "Wow. That looks really hard. How would you get it braided like that?". My response was, "You braid it". He said, "I don't know how to braid". Haha. He is such a boy. 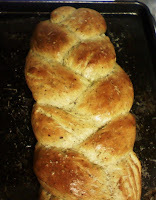 Anyway, I thought I would take on the challenge of braiding the bread. It really isn't hard if you know how to braid :0). Mine isn't nearly as pretty as the one in the magazine but it turned out pretty good and it tastes yummy! It reminds me of the bread you get in restaurants to dip in EVOO. You could do two loaves (divide dough into 6 portions and make 6 ropes). The smaller loaves would be perfect for a party. Mix warm water, sugar and yeast in a small bowl. Let it sit 5-10 minutes or until it is foamy. If after 10 minutes it is not foamy, start over. Your yeast may be old or your water temperature too warm or too cold. You just want it lukewarm. Meanwhile, heat milk and butter in a saucepan until butter is melted. You don't want the mixture to get too hot. In a large mixing bowl, place 1 1/2 cups flour, basil, dill, salt, garlic powder and rosemary. Add the milk/butter mixture and stir until combined. Add the egg and stir until combined. Pour yeast mixture into bowl and stir until combined. Add the remaining flour 1/2 cup at a time until a soft dough is formed. I ended up using 4 cups of flour total but it really depends on the weather that day. Knead for 4-6 minutes and then let rest for 10 minutes. Divide dough into thirds and shape each into 15 in rope. Place ropes on a greased baking sheet and braid. Pinch the ends to seal and tuck under. Cover and let rise in a warm place until doubled (about 30 minutes). Bake at 375 (uncovered) for 20 minutes or until golden. Brush with melted butter or evoo and sprinkle with salt. We love curry in our house. I used to make Rachael Ray's Curry in a Hurry recipe once a week. It is awesome and really cheap because once you buy the two main ingredients (curry paste and mango chutney) they will last a while. Rachael's recipe actually calls for mincemeat but I use mango chutney. Also, I buy Patak's Curry Paste which I think is the best of all the brands. It costs $5 but it will last a long time! 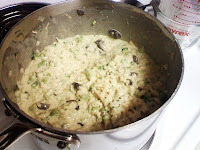 I started making another recipe recently that I got from the online cooking school that I do. I changed it up just a little bit. Chris and I love it! If you like traditional Indian curry, then this is for you! This meal just makes the cut of under $10. It costs around $9.95. Now, if you already have all of the spices, then it will be much cheaper. Heat the ghee over medium heat in a large fry pan or Dutch oven and sweat the onions, bay leaves and salt for about 25 to 30 minutes. You want the onions to sweat slowly. If they look like they are going to start to brown, turn the heat down. Meanwhile, peel and roughly chop the garlic, ginger, chilies and place into food processor and puree. Once the onions are very soft add the garlic, ginger and chilies and cook for another 3 minutes. Then add all of the remaining spices and seasoning and cook for another 2 minutes. Add the water and bring the mixture to a boil. Reduce the heat to low and cover. Let the mixture simmer for 10-15 minutes. Add the diced (uncooked) chicken into the sauce, replace the lid on the pot and simmer for another 10 -15 minutes or until the chicken is no longer pink. Grind the almonds in a food processor. Then add the cream and blend until you have a smooth paste. Add the almond paste to the chicken and onions and stir. Check for taste and adjust seasonings if necessary. To finish add the chopped cilantro and serve over rice (preferably jasmine). You can buy Ghee in stores but it is much cheaper to make yourself. This is just a simple process of removing the milk solids from the butter. It allows the butter to be cooked at a higher temperature without burning. Take a stick of butter and melt it in a saucepan over low heat. Let it continue to cook until you see the layer of milk solids has separated. You can strain the butter through a cheesecloth to remove the milk solids. I just take a spoon and skim off the milk solids and discard them. Tip: If you don't have some of these spices, I would suggest you go to a Fresh Market or Earth Fare (if you live near one). They sell their spices in small plastic bags and are WAY cheaper than the grocery stores. Also, walmart has really cheap spices as well. So, I just spent the last 2 hours planning our meals. We have 12 dinners before we get paid. Since money is a little tight, I decided to try to get all 12 dinners (plus lunches and breakfast stuff) out of our normal amount of money for one week of groceries. My plan is to make 6 meals that can all be eaten twice or that I can used to make another meal. So, for all of the meals that are casseroles, I will make the whole recipe and separate it into 2 or 3 8x8 pans depending on how much it makes. We will eat one that night and save the other for the next week. Hopefully, we will like these recipes enough to eat them twice so close together : ). My estimated cost of all of these meals plus lunch and breakfast stuff for my boys is going to be $100. I will let you know what happens! Preheat oven to 375. Cook ravioli according to package but take a few minutes off of the cooking time as they will continue to cook in the oven. Lay flat after draining to keep them from sticking together. Set aside. Brown meat in large (high sided) skillet with a few swirls of EVOO. Brown until the meat has some crispy parts to it. Move the meat over in the pan and add onion and garlic to the pan. Cook until tender...about 6 minutes. Deglaze the pan with the cup of wine or stock making sure to scrape up any bits on the bottom. Cook for 5 minutes. Add allspice, salt, pepper, Worcestershire and stock. Bring to a bubble and then add the tomato sauce. Cook until it thickens a bit (about 15 minutes). 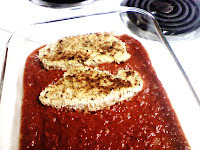 Place a cup of tomato sauce in a greased 9x13 pan. Place a single layer of ravioli on top of sauce making sure to get ravioli into the corners of the pan. Repeat until all the ravioli is used (3-4 layers). The top layer should be sauce. Then top with your cheese. Bake for 10 minutes. Let sit for about 5-10 minutes after it has baked. This is a great comfort meal that I hope you enjoy!! Thrifty Thursday meals are always a meal for a family of four for under $10. Today, you can get two meals out of this meal by only buying 4 hoagie or sub rolls. Make your tomato sauce ahead of time (takes 45 minutes to simmer). It will be enough to put half of it in the freezer or save it for another meal later in the week. Heat large skillet over medium high heat. Add a couple tablespoons of EVOO (a few times around the pan). While it is heating, prepare dipping trays. In one, place the two eggs, whisked. In another, place the flour. In the third, mix together panko, Parmesan, thyme, parsley, basil, garlic, and red pepper flakes. Season each tender liberally with salt and pepper. First, dip tender into flour (shaking off excess). Then, dip it in the egg mixture. 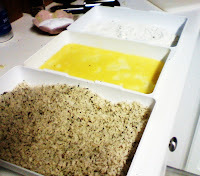 Lastly, coat in bread crumb mixture pressing the chicken into the mixture to coat thickly and evenly. Begin frying your tenders in the EVOO (3-4 minutes on each side until they are golden). They do not have to be cooked all the way through. Make sure to not overcrowd the pan. You might have to do a couple batches. As each batch finishes, place them on a cooling rack with a cookie sheet or paper towels underneath. 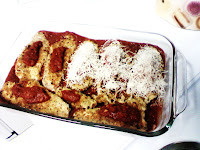 In a 9x13 casserole pan, place 1 1/2 to 2 cups of tomato sauce. Place chicken tenders on top of the sauce in a single layer. Put a spoonful of sauce on each tender. Then, top with shredded cheese or slices of cheese. Sprinkle with some Parmesan. Bake for 10-15 minutes. You might want to turn the broiler on for the last 2-3 minutes just to slightly brown the cheese. You can make this dairy free by just leaving the cheese out of the bread crumb mixture. Then, when you assemble it just leave off the cheese or put cheese on those that can have it and leave a few tenders without cheese. Great roll over meal: Open hoagie rolls (flat but still connected), place on a baking sheet, drizzle with EVOO and toast in the oven on 425 degrees. Once toasted, rub a garlic clove over each piece. The heat will melt it onto the bread. Spread a spoonful or two of sauce on bottom side of hoagie. Top with chicken. Sprinkle with cheese and put under the broiler in the oven just until cheese is melted. The other night I also put a couple of pieces of pepperoni on top of the sauce (before the layer of chicken) and I caramelized some onions and placed them on top of the chicken layer. YUMMY!! This is the basic tomato sauce that I make. It is extremely simple and tastes great. It will store in the refrigerator for a few days or frozen for several months. I would make a double or triple batch of this and freeze it so it is ready to go when you need it. You can also add other spices that you like to change it up. Put it with some ground turkey, beef, or sausage and put it over your favorite pasta. Tip: When buying canned tomatoes, look at the ingredients closely. Good canned tomatoes should only contain tomatoes or maybe tomatoes and water. All of the other ingredients...salt, citric acid, etc. do not make good canned tomatoes. However, if those tomatoes are the best price then it is just fine and your sauce will still be delicious! Heat a heavy-bottomed saucepan over medium-low heat. Then add the oil, followed by the onions. Next, add a pinch of salt and let the onions gently cook until they soften and just begin to turn a slight golden color...not brown. Once they’re ready, add the garlic and cook for about 1 minute or so, just until softened or until you can begin to smell it. Stir in the tomato paste and let it gently cook for a few minutes until it becomes a shade darker. Then add the tomatoes and a good pinch of salt. Now, stir to combine and bring to a simmer over medium-low heat. Cook uncovered for about 45 minutes, stirring occasionally to prevent scorching. Once the sauce has finished cooking, turn off the heat and taste for seasoning. Add salt and pepper as you like. Add the basil...just tear into pieces by hand and drizzle with a tbsp or 2 of EVOO. A friend of mine requested that I post my Macaroni and Cheese recipe. 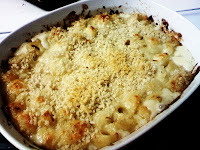 Mac and cheese is one of my absolute favorite things to eat and fun to make. My friend, Brittany, gave me a great idea the other day that she found somewhere. Make the mac-n-cheese in cupcake tins and store them individually in the freezer. This is great if you have kids! Pull them out and pop them in their lunchbox. Cook the noodles according to the package except cook just short of al dente. So, if the package says to boil for 8 minutes then boil them for about 6. You will really just have to taste test them. You want them to have a pretty good bite to them because they will continue to cook in sauce when you bake it. Be sure to use about 4-5 quarts of water for every pound of pasta and 2-3 tbsp of salt. The salt does not significantly increase the boiling point but it is the ONLY chance you have to season the pasta. Also, do NOT add oil to your pasta water. This does not keep your pasta from sticking AND it prevents whatever sauce you use from coating the pasta. If your pasta is sticking together, then you aren't using enough water which lets the pasta move freely in the pot. While the pasta is cooking, begin to make your Bechamel sauce. In a medium saucepan heat the milk, garlic and thyme on low-medium heat. Allow it to get warm. Once it is almost warm, melt half of the stick of butter in a skillet. Once melted, sprinkle with the flour. Whisk for a couple of minutes (you don't want it to get dark). Drain the garlic and thyme from the milk. Whisk the milk into the butter/flour mixture (roux). Allow to cook for a few minutes to thicken. Season with salt and nutmeg. Add 2 1/2 cups of the shredded cheese. Add the pasta to the cheese sauce. Pour into a greased 9x13 pan or other casserole dish. Sprinkle with remaining cheese. Cut remaining butter into small 1/4 size cubes and place around on the top. Then, sprinkle with the panko crumbs. Bake at 375 degrees for about 30 minutes or until bubbly. 1. Crisp bacon and saute with onions...put on top after Mac and Cheese comes out of the oven. 3. BLT - add crispy bacon and sauteed leeks to the mac-n-cheese before baking. Then, top with diced fresh tomatoes. 7. Add sauteed chopped red peppers and onion (and maybe some jalapenos) and switch out half of the cheddar cheese with Monterrey Jack for spicy mac-n-cheese. Try your own additions and then let us know what you did! !